Up To The Sky is a new solo album of songs for voice and cello by cellist/singer/songwriter Serena Jost, captured live in the historic St. Peter’s Church in Chelsea, NYC. It was recorded under the church’s rafters with eight microphones over two days by Adam Gold, then mixed by Chris D. Butler in Brooklyn. The album includes originals, some unusual covers including a song by Molly Drake (Nick Drake’s mother) and an array of instrumental and vocal improvisations. Up To The Sky is being released April 6th, 2018 by Second Kiss. 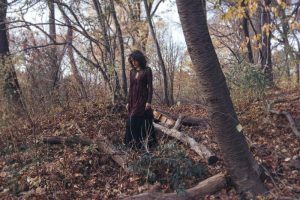 Serena Jost writes and performs songs that are at turns seductive, edgy, affecting, and otherworldly. A dynamic singer and cellist with a hauntingly beautiful voice, she is a unique performer whose music evokes vivid emotional landscapes. “Serena Jost writes gently eccentric songs and sings them in an elegant alto, often accompanying herself on cello. The term art song—normally tied to 19th-century concert music—usefully characterizes Jost’s carefully arranged pieces and succinct lyrics, neither quite rock nor folk” —Time Out NY. Clement Clarke Moore, author of the Christmas poem “A Visit from St. Nicholas“, which became widely known as “Twas the Night Before Christmas”, donated the land to the new Saint Peter’s and the current church building was consecrated in 1838. Serena was also drawn to the church because of its rich musical history: the church offers regular concerts of classical music and beyond, including live shows by the band 30 Seconds to Mars. This solo album is a departure from Serena’s past two albums that were recorded with her band. There are moments of solo cello work on other albums but Serena wanted to fully explore that and the raw sound of live recording after her band recording experience. She has always been drawn to the intimacy of sacred spaces. After singing a few notes into the nave, she knew she had found a magical place. In some sense, the history of the old stone church also echoes the history of Serena’s own 1910 cello. Her family originally acquired it in Atwood, Michigan, where it was found wrapped carefully in a blanket in the basement of a Northern Michigan home. Serena has always felt amazed by the discovery of her instrument and finding the historic church inspired her – it seemed like a fitting setting to perform with an instrument that had its own unique history. Serena’s previous album, A Bird Will Sing, was produced by the legendary Anton Fier (Golden Palominos) and recorded with her band, Julian Maile, Rob Jost and Robert DiPietro. Brad Albetta (Martha Wainwright) produced her debut, Closer Than Far. She has performed in Europe and the UK and throughout the US and Canada. Growing up between The Midwest and Switzerland, Serena walked along the Great Lakes and over mountain passes (she comes from a long line of gown-wearing, horse-riding yodelers). A classically trained cellist and singer, Serena found her true calling writing poetic songs and accompanying herself on cello and guitar. She happily calls NYC home, where both her Midwestern friendliness and Swiss persistence come in handy. Serena has performed at seminal NYC venues such as Joe’s Pub, Le Poisson Rouge, Rockwood Music Hall, The Living Room, Barbès, The Owl and The Kitchen. She has collaborated with poet Dan Machlin (Immanent Audio, Ugly Duckling Presse), and numerous dancers, including Douglas Dunn and Kathryn Sanders (Wally Cardona). She led a 50-cello performance on Governor’s Island with co-composer/cellist Matthew Robinson in July 2015, and has sang, played and recorded with many musicians and composers. Serena has toured both nationally and internationally with her own projects and with other bands. She was an original member of Rasputina, the well-corseted cello group.